So this is what Bear the Mitzvah Dog and his friends have been up to lately! Wishing everyone a joyous Sukkot! Bear the Mitzvah Dog was worried. Here he’d been practicing the Four Questions for weeks (he is the youngest in the family if you don’t do any multiplication by seven, if you know what I mean), and now it looked like he may not even be at the seder! “…But anyway, Passover starts Monday night at Pet Camp. 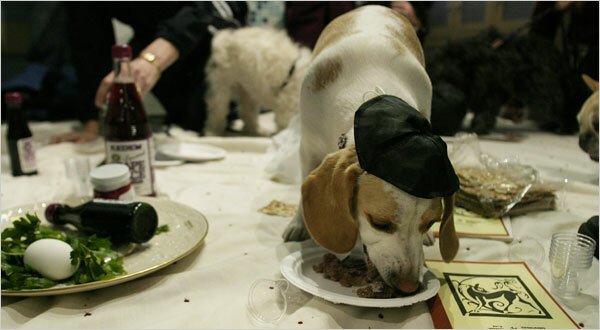 We thought about having a Seder but we knew the dogs wouldn’t follow the order and having four bowls of wine (Mark wanted to serve Slivovitz too) is a bad idea. So we settled on just hiding the Affikomen. Hopefully those beagles won’t win again. And, no, we are not going to try and get the campers to dye eggs again this year. Last year was a fiasco – we knew we wanted to paint the building; but we didn’t want it to look like a Jackson Pollock when we finished. My husband sensed someone was glancing over his shoulder and turned around to see Bear looking very distressed. My husband looked at Bear, then the computer screen, and then back again at Bear and realized what our dog was thinking. So, he reassured Bear that he would not be sent to camp and that his learning the Four Questions had not been for naught. Bear will most definitely have a seat at – or more likely, under – the seder table come Monday night. 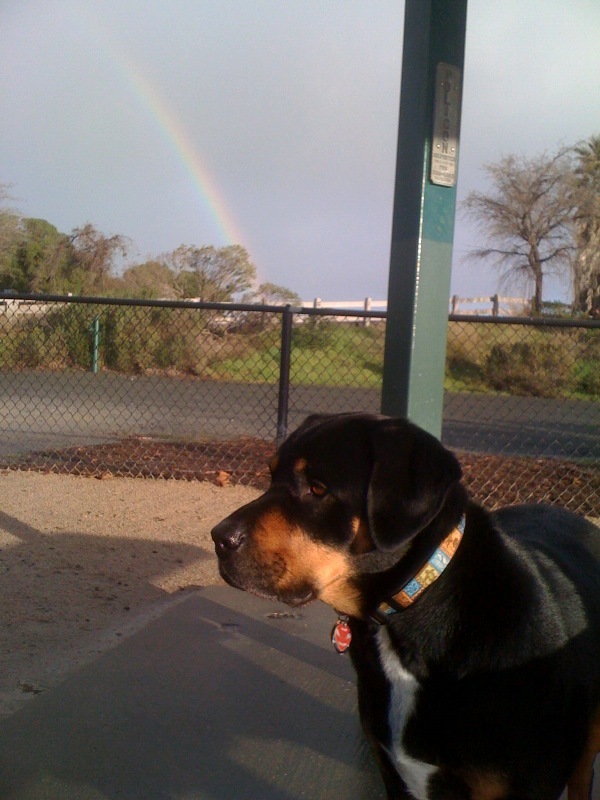 For us, when it comes to having Bear in our family, life really is "all puppy dogs and rainbows." Today, Bear the Mitzvah Dog turned six and also celebrated a year and a half of being part of our family. Of course, Bear really had no idea of the day’s significance. The joy was all ours. March 15th isn’t really Bear’s birthday. We do know that he was born around March 2004, so we have chosen this specific day of the month to mark the passage of time in his canine life. I am sure some of you are thinking that we should beware the Ides of March, but we see special meaning in this particular date that makes us overlook Shakespeare’s cautionary advice. You see, just as Bear’s real birthday likely isn’t March 15th, so too was this day probably not the exact date of birth of my Bubbe and Zaida, despite the fact that they celebrated their birthdays on it. From what I remember once hearing, my Zaida never really had a birth certificate from Russia (at least he never arrived in Canada with one), and my Bubbe’s documentation disappeared when a government office in her hometown of Lethbridge, Alberta burned down when she was a child. The story has it that March 15th rang a bell for my Bubbe, so when she married my Zaida, they decided to celebrate their birthdays together on that day. At least they knew that he had been born in 1909 and she in 1912. From what I have heard, this kind of birthday invention was not all that uncommon among uneducated immigrants whose vital statistics documents went missing or were non-existent in the first place. Bear prefers the peanut butter variety. So, it is in honor of my paternal grandparents and this little bit of family lore that we carry on family tradition by celebrating Bear’s birthday on March 15th. It would have been nice if one of our boys had coincidentally been born on this date, but that did not happen, and when it comes to people you can’t fudge DOB’s anymore. In any case, I think my Bubbe and Zaida would have been tickled to know that we are honoring them in this slightly quirky way. They, themselves, had a dog while my father and aunt were growing up, and I am sure that they would have loved Bear. 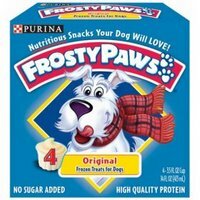 It’s time to go celebrate with some peanut butter flavored Frosty Paws doggie ice cream (for Bear, not us…though it does look quite tasty as far as dog food goes).